Steve had begun his career with Portsmouth after being spotted playing for Gosport Borough, and made his debut for Pompey in August 1981 at the age of 18, scoring 3 goals in 31 appearances during the season. After a management change however, he only made the odd appearance, going on loan to Aldershot in March 1984, before moving north to Sunderland at the start of the 1984/1985 season. After a season that culminated in a League Cup Final appearance at Wembley, another change of management saw him confined to the bench. In December 1985, he was transferred to Newport County where he spent two seasons. Further moves followed to Swindon Town andAldershot before Northampton Town paid £45,000 for his services. The three year contract saw him make over 100 appearances for the Cobblers. 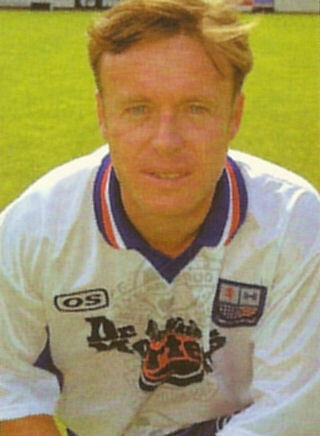 He moved to Germany in 1992, to play for SV Darmstadt, before several seasons with Instant-Dict of Hong Kong. He returned to the UK in the summer of 1995, and joined Stevenage Borough, where he captained the side to the Conference title the following May. After the club were denied promotion into the Football League, he joined Kettering Town in July 1996 where he was also named as club captain. Following the departure of manager Gary Johnson in October, he took over managerial duties and continued in that role for the two seasons until a fall out with Chairman Peter Mallinger in May 1998 saw him return back to Stevenage Borough. He had made some 89 appearances for the Poppies, and some 64 appearances for Stevenage in his two spells at Broadhall Way. Steve arrived at Nene Park in April 1999 on a one month loan from Stevenage, and he made his league debut in a right back role against Woking on 5 April 1999, the game which followed the defeat by Cheltenham Town that had sealed Diamonds fate that season. He remained with the club in a coaching capacity the following season. Making just one more substitute appearance in the Hillier Senior Cup tie at his former club, Kettering Town. He left Diamonds in 2000, to take up a similar coaching role at Bedford Town. He finished his playing career at the age of 42 at Cogenhoe United, where his side came close to reaching the 1st Round of the FA Cup in December 2005. He is currently head of recruitment with a market research agency, based in Paris.